I was recently contacted by Megan of Monkey Bar Storage in Columbus, OH. She reached out to collaborate with me on what it takes to design a gallery wall in your home to display your beautiful images! As a photographer who specializes in custom wall art and designing wall galleries for my clients, I was excited to help out! Megan wrote this blog post and included some helpful tips, as well as included images from my portfolio to design the walls. This is a custom feature I offer my clients from every session. I hope you enjoy the post! I often find myself wanting to reorganize my home without having the time and resources to give it that total makeover I’m hoping for. Yet, there are several different things I can change without spending a fortune and it eating up all my spare time. I have found that really focusing on my living room has given my home a fresher feel and helps any guests feel more welcome. Here are a few tips to beautify your living room by simply organizing the pictures on the wall. Make sure that the frames you choose for your gallery wall coordinate with the furniture and wall decor to keep the cohesive feel in your living room. Don’t be afraid to use different sizes, colors, and shapes as long as they all work together without clashing. You can also find artwork that fits with the style of your home to incorporate with your gallery wall. Before you start hanging your pictures and artwork, be sure to layout each frame on the ground how you want it to look on your wall. Space them out exactly how you are thinking so you can take the measurements. You can also take string or tape to map out the bottom and top of the wall so you know how high up you’ll want your pictures to hang. Don’t forget to take note in the layout where sofas or shelving units may be so you don’t run into issues when you start hanging. It can be tricky to remember which measurements go with each frame and where on the wall you want to place them. You can bypass this by using sticky notes or easy peel tape. For each picture, measure how far apart the d-rings on the back of the frame are to make it easier when hanging. You will also need to measure how far apart each frame is from the next. This will include how far up the bottom pictures will be from the base of your wall. Depending on what kind of wall and paint you have in your living room, you will need to purchase different kinds of wall hangers. If you have heavier pictures make sure you have a wall mount you won’t have to worry about staying up. Here are a few ideas of wall hangers you can use for your pictures. Using the measurements, you’ve already taken, start hanging your pictures! Be sure to double check measurements as you go along to make sure you don’t have to put more holes in your wall than necessary. Take your time and make sure you know how your wall hangers go into your wall properly. It can be incredibly frustrating if you have to uninstall and install hangers over and over again. It is also helpful to have a level handy to help make sure your pictures aren’t slanted to give your gallery wall a professional look. Organizing your gallery wall can take a while, so make sure you take a step back to admire your handiwork! If you have pictures from Jacqueline Marie Photography included in your gallery will be sure to send her a picture of your wall as well. Professional pictures make every gallery wall come alive and Jacqueline would love to admire your wall with you. Organizing the pictures on your wall is the first giant step to beautifying your living area. Finding 5 or 10 minutes here or there will help you organize the rest of the room. What other ideas do you have to beautify your living room? This post was written by Meghan Harris at Your Garage Guys. She enjoys traveling with her husband, teaching new tricks to her dogs, and keeping up with the newest interior design trends. I loved the evening I spent with the Greco family from Powell, OH. 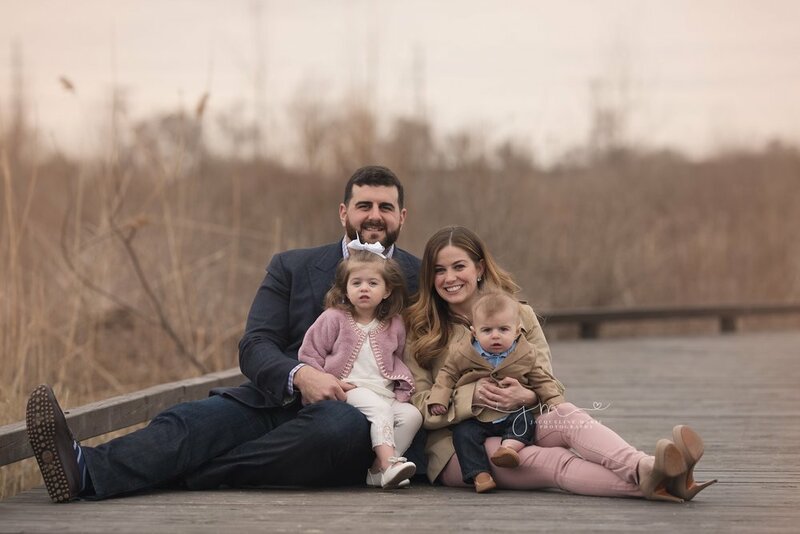 They are an adorable and sweet family of four! Jodi first contacted me about planning a family session with her only request to have the session by the end of March. With the lovely Ohio weather we have, I kept my fingers crossed we would have a decent evening. With a few reschedules for weather, we had a great night! We chose the Grange Audubon Center in downtown Columbus fore their session. Spring wasn't quite in bloom yet, but I think the location was perfect. Their little ones are adorable and did great! i love capturing the true love between a family. It's one of my favorite things. I especially love the images of the family interacting and smiling with their children. They are always my favorite images! I will share some favorites of their session. I'm so glad the Greco family loved their whole gallery. It was a pleasure to meet you and capture these family memories! 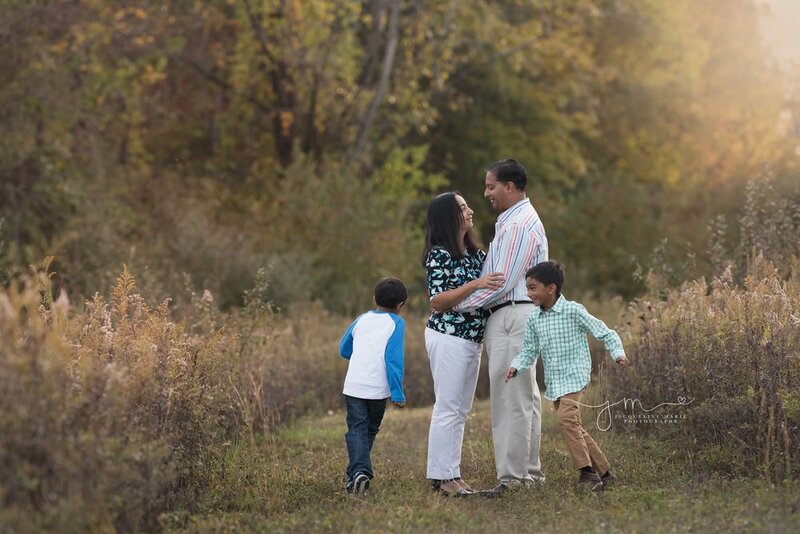 I had the pleasure of meeting the Saha family from New Albany, OH for an outdoor fall family session. 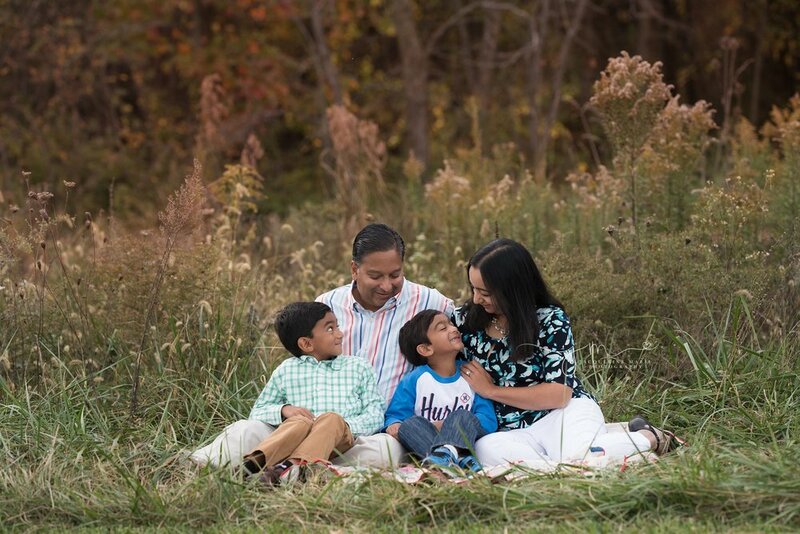 When Roopa first contacted me about a session, her only request was that we did the session in New Albany. Rocky Fork Metro Park was the perfect location. I enjoyed getting to know their sons too! We talked about the activities they enjoy, and I can't forget the new penguin stuffed animal that joined us too! It's been a pleasure to capture these family memories for you Saha family! May you all cherish these memories for many years and generations to come! I had so much fun with the Dainton family from Columbus, Ohio. 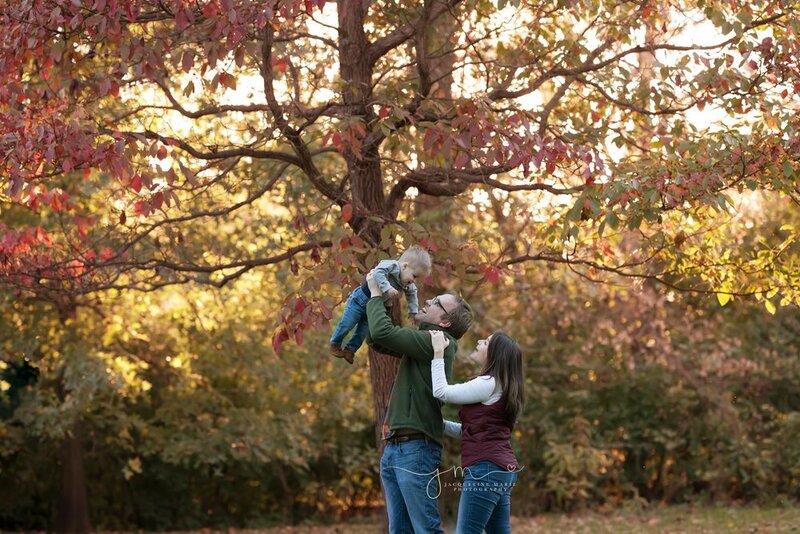 We did their outdoor family session this fall in Pickerington, Ohio. 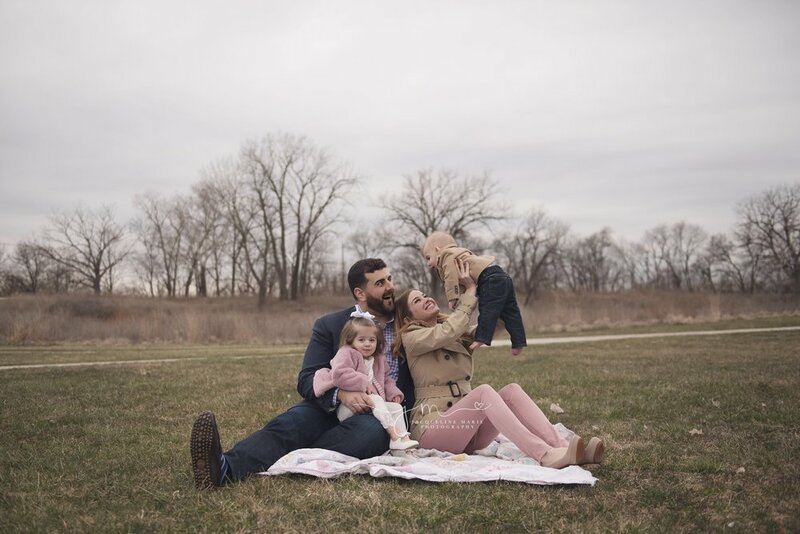 When Laura contacted me about a family session she had some great ideas. She wanted her session to take place in a creek! It was so fun planning and shooting their session. Their little boy Griffin was adorable and shared some cute smiles with us! They also included their dog and grandma since she was in town visiting. Which by the way, their dog is so well behaved and did amazing! During the session Laura wanted to incorporate her dad's fire helmet as a memory to be photographed with Griffin. I love the way the images turned out. It was such a beautiful evening and we ended the session splashing around in the creek. I enjoyed our time together Dainton family and I hope you cherish these memories for years to come!